On the 7th of December, Vladimir Putin announced that he would run for a new presidential term in March 2018. So far, he has not presented a programme or agenda for his fourth presidential term, which is expected to last from 2018 until 2024, and it is very unlikely that he will do it in the nearest future. However, particular developments in Russia in December can give us a glimpse into what we can expect from Putin’s Russia 4.0. When Putin announced his decision to run for presidency again, Russian elite groups probably sighed with relief. Some Russia experts use the expression “The Kremlin has many towers” to refer to the fact that Putin’s regime is not a coherent whole, but a conglomerate of different elite groups – each with their own interests and agendas – that compete for resources and often seek to undermine their opponents from other elite groups. Putin, in this system, plays the role of a moderator of the competition and an ultimate arbiter of the conflicts between the elite groups. This role makes Putin unique: he has built this system himself and for himself, which means that his potential departure from the referee’s tower, i.e. not running for, and winning, the presidency in March 2018, would dramatically destabilise the system and bring about its collapse. One may say that the elite groups need Putin’s presidency more than he does, but Putin needs it too, because he has not yet found a person who would succeed him and give him a security guarantee – similar to the guarantees that Putin granted to President Boris Yeltsin when he handed the reins of power over to Putin in 2000. Moreover, if Putin found such a person, no-one would be sure that he (or, very unlikely, she) could be accepted by the different elite groups as a moderator of their conflicts. Indeed, a person who can potentially succeed Putin can only come from one of the elite groups, but this would elevate that one group, afflict the others and, again, upset the balance of the entire system. Yet even now one can observe that Putin’s system is already being destabilised. 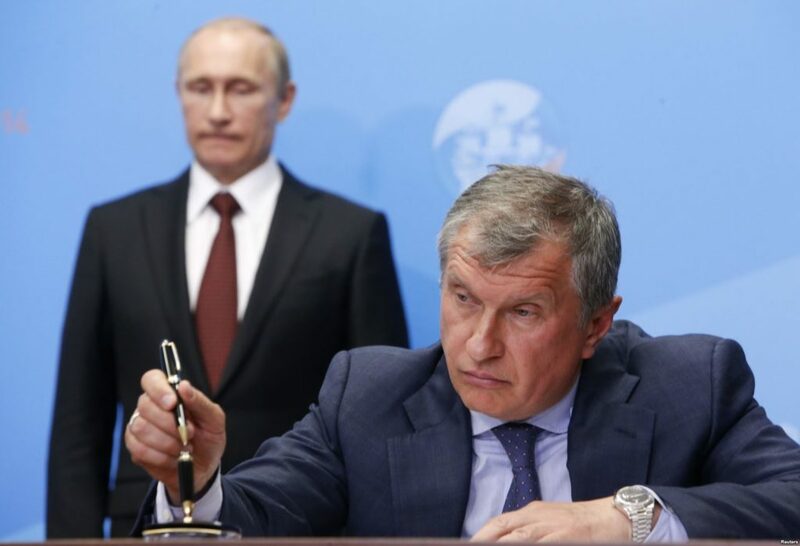 The troublemaker is Igor Sechin, the US-sanctioned CEO of the Russian state-owned oil company Rosneft, the leader of one of the most conservative elite groups and perhaps the closest associate of Putin – Sechin has also served under Putin in his various positions since 1994. In 2016, Sechin initiated – with the help from the Federal Security Service – an allegedly anti-corruption case against now former Minister for Economic Development of Russia Alexei Ulyukaev who, as Sechin stated, tried to extort a bribe from him. In December, Ulyukaev was sentenced to eight years in a prison colony. Having initiated the case against Ulyukaev, Sechin broke the unspoken rule of the competition between the Russian elite groups: to keep conflicts between them out of the public eye. Ulyukaev’s widely publicised case is, in fact, not about him: compared to Sechin, he is a minor figure. Rather, the case demonstrates that Sechin has made a very bold and insolent move to humiliate and damage the antagonistic elite group to which Ulyukaev belonged, namely the pragmatist and economically liberal circle around Prime Minister Dmitri Medvedev. And this means that Sechin’s ultraconservative elite group has gained the upper hand in Putin’s system and, thus, disrupted the balance within it. There are other several indications that Putin’s system during his fourth term will become even more conservative and reactionary, but also even more anti-Western than it was before. Putin has been officially nominated a presidential candidate on the 26th of December at an exhibition titled “Russia – my history” organised by Russian Orthodox Bishop Tikhon. The latter is considered to be a spiritual advisor to Putin and is an unofficial leader of the monarchist and extreme conservative circle within the Russian Orthodox Church. The choice of place for the official nomination has a symbolic meaning too: many Russian historians argue that Tikhon’s exhibition, while full of factual mistakes, praises conservatism and authoritarianism, as well as showing that all attempts to democratise Russia are Western plots and naturally alien to the Russian people. The Kremlin’s misuse and revision of history, legitimisation of openly authoritarian practices and increasing obsession with “Western conspiracy” has also manifested in a recent interview of Alexander Bortnikov, the head of the Federal Security Service – another powerful elite group within Putin’s system. In this interview, Bortnikov justified Stalin’s political mass repressions by the need to fight against “foreign agents”, and in Bortnikov’s opinion the fight against the “fifth column” in Russia needs to continue, because “the destruction of Russia is still idée fixe for some” in the West. The rise of the extreme conservative elite groups destabilises Putin’s system, and this destabilisation limits the flexibility of the regime – a flexibility that has so far been the main advantage of the system both domestically and internationally. Now, it seems, that Russia 4.0 will mobilise the society for the support of the regime around three ideas only: the country’s historical grandeur, its non-compatibility with democracy and Western conspiracy. Against the background of Russia’s continuous economic and social decline, this means that Putin’s regime will become even more oppressive at home and more aggressive in foreign relations.